Even when he was a kid, he had always wanted a place in the country away from people. Sure, he had to put a lot of work into it over the years, but he was still in pretty good shape. He’d just cleared that dead tree which he’d turn into firewood tomorrow. 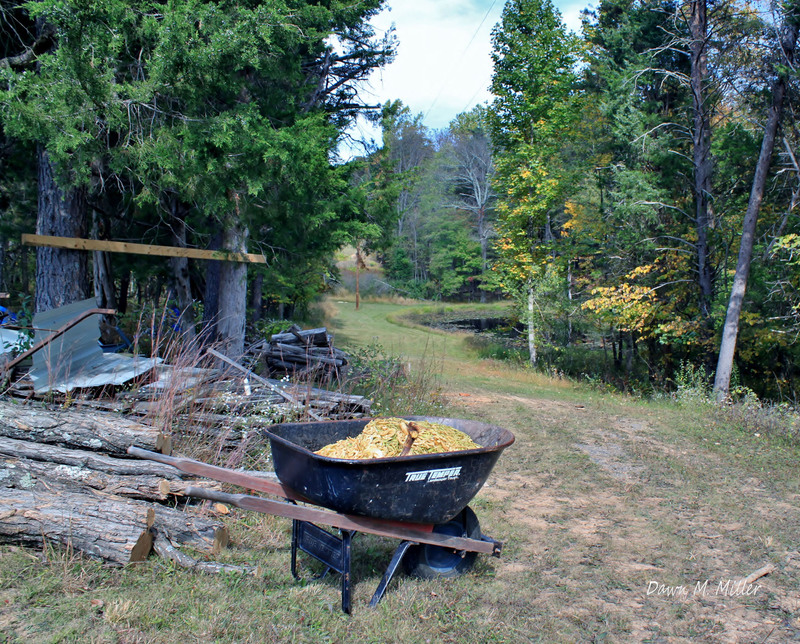 “Leave the freaking wheelbarrow for later, too.” He wiped the sweat from his brow with an old rag and then took a moment to look back down the dirt drive. It was almost a mile to the road, and that was just some little, rural ribbon of crumbling asphalt. He drove into town every other week or so to buy supplies augmenting what he grew in his field out back and the two hothouses. He never had internet put in or used satellite for TV. Power came from solar and wind, used a septic tank since he was too far out for sewage, he was as self-sufficient as he could manage. Conceivably they could still find him. He was as about off the grid as you can get, but they were relentless. When you pull off the world’s first skyjacking, you’ll never fall off their radar. I wrote this for the Sunday Photo Fiction Challenge of February 4th 2018. The idea is to use the photo above as a prompt to create a piece of flash fiction no more than 200 words long. My word count is 198. In case you haven’t guessed, I’m talking about the man authorities know as D.B. Cooper who, on 24 November 1971, hijacked a Boeing 727 extorting $200,000 (a lot of money in 1971) and then bailing out of the aircraft somewhere between Oregon and Washington. His true identity and whereabouts, assuming he survived the parachute jump, have never been established. I read a news story yesterday where someone claimed to have broken the code Cooper left behind in his note of demands. Supposedly, Cooper is really Robert Rackshaw, a former member of Army intelligence, and the code he employed was one recognized as used by his unit. Rackshaw is still alive and residing in the San Diego area but the FBI issued a statement saying they have no evidence to solve the case. I had “Cooper” on my mind, so I thought I’d write about him. I like the idea of finding a peaceful place alone, but what’s he going to do with his $200,000? Seems like he doesn’t really need it for himself. Ha! Without even reading your afterward, I knew you meant D.B. Cooper. He had to do something like what you describe to disappear as completely as he did. Well done! Interesting scenario you’ve given us this week. Enjoyed the little history blurp, too. Love the self-sufficiency aspects of this. There’s a whole movement about “Off Grid Living”. I even follow the group on Facebook, Jelli. DB Cooper? Yeah, he’s something of a folk hero if only because he’s the first to think of skyjacking. Are you talking about the real D.B. Cooper? Yes, he was given the $200,000 in cash and parachuted out of the aircraft through heavy cloud cover into the Oregon wilderness. What happened to him after that, no one knows. There was a claim that some of the bills from his loot were found years later in the woods, but no one knows what that’s supposed to mean exactly. Gosh, I can’t believe I’ve never heard of it. A quick Google search should provide you with plenty of material about Cooper’s skyjacking and the subsequent investigations. I was thinking I should do that, but I was being lazy and asking you. LOL. You’ll get a wider variety of material from Google. Thanks, Susan. I once saw a documentary on DB Cooper and the chances of him making it safely to the ground with the weather and terrain involved was pretty slim, although you never know. I think some criminals would make far more going straight, instead of putting so much into really off beat ideas. Perhaps, but then we don’t know anything about Cooper’s motivation beyond wanting cold, hard cash. Maybe it was the quickest way to put together a nest egg, Michael. It’s probably wrong, but sometimes you can’t help but hope the criminal gets away with their heist.Great tale, interesting footnote James. After a big heist, you’ll never stop looking over your shoulder, even decades later. Nicely done. I like to think of DB Cooper setting down to a quiet, peaceful life. I’m sure he would too if he’s still alive. Thanks. I remember reading /watching about this incident, and there a lot of hat-tips to it in movies /TV series too. But what happened next is equally fun to imagine. Wow what a coup for him. I hope he has plan B, and plan C, should he ever come close to being caught. Hopefully enough money to disappear again. $200,000 doesn’t go as far as it used to and I’m sure he spent a bundle on the land and equipment to live off the grid. Thanks, Mandibelle. You’re welcome. Guess he needed to take more if he wanted to stay safe. Wasn’t thinking ahead I guess? You’re welcome! Back in 1971, $200,000 went a lot farther than it would today. It’s not just what things cost but what the dollar (or whatever currency) will buy. in the 1950s or 60s may have seemed to have earned a ridiculously low salary compared to what the same job would pay today, but that amount of money may have bought a lot more goods and services. My wife has several magnets on our fridge which tell what certain goods and services cost in years gone by. For instance in 1957, a new house cost on average $12,225.00, the average income was $4,594.00 a year, gasoline cost 24 cents per gallon, and a U.S. postage stamp was 3 cents. In 1988, a house cost $91,177.00, the average income was $24,457.00 a year, gasoline cost 91 cents a gallon, and a postage stamp would run you 25 cents. The interesting thing is to compare the radio of income to housing costs. It’s not stable across time so what an average person can afford isn’t either. That’s really neat. And of course your right. Perhaps what we earn now makes certain cost of living increases as affordable? Or in some cases, maybe not as you say income and goods etc. aren’t stable.